[Music] is such an underrated resource, yet people use music every day. We have it in our cars, on our phones, in the grocery store – it is everywhere we go and it is used to alter or encourage our own moods. My hope is that people will be able to recognize music not only as an art form, but as a tool to help others overcome obstacles in their life. It was once said that music is what feelings sound like. For the average person, we would all agree that music can transform our attitudes, change our perspectives, set a mood, help us from feeling alone… the list goes on. But how does music affect someone who has mental or physical disabilities? This has been something that I have been more interested in as I have grown older. Given my own difficult family situation, I used music as an escape. Practicing became a way to disappear out of the discomfort in my household and focus on something beautiful. What about people who are uncomfortable in their own body or their own mind? I soon began to question if music would have the same effect on people other than me, other than just musicians. Music therapy embodies this very idea. On the website for the American Music Therapists Association, it is defined as, “the clinical and evidence-based use of music interventions to accomplish individualized goals within a therapeutic relationship by a credentialed professional who has completed an approved music therapy program.” These goals can be anything from opening oneself up emotionally to distracting someone from intense pain to encouraging verbal communication. Therapeutically, the benefits are endless. I have quickly learned that, not only is music enjoyable and mood altering, but it is a growing resource for therapists dealing with people who suffer from any type of disability or disorder. When I sought out the music therapist, Eve Montague, at the South Shore Conservatory in Duxbury, I was just looking to have her shed a little light on this topic. She was able to share many stories with me: a patient with serious physical problems regaining use of her fingers and toes, a premature infant’s heart and breathing rate stabilizing immediately after birth, a burn victim becoming seemingly immune to the pain while having his dead skin removed – all through music therapy. It seemed unreal. I knew that music was powerful, but could it really have that much of an effect on people? I’ve experienced it myself, but never to this degree. In my excitement, I began to participate in an adult chorus with Eve at the Conservatory, working with mentally delayed adults to sing and make music once a week. It was a place where people could socialize, learn about music, and most importantly, grow as a person. There was a woman who was nonverbal but still able to make sounds. Throughout the year, I soon realized that she was mouthing the words and actually quietly singing along. A young boy who shyly kept to himself before chorus was a new person when it came time to sing – yelling the words, jumping for joy at the climax of a song. This was all through music. Another therapist who works with Eve, named Kari O’Brient, travels to several locations offsite for her therapy sessions. When I asked to observe her at a local elementary school, I had no idea what to expect. All I knew was that I wanted to see music therapy first hand, in all of its glory, to better understand how it really works in an everyday setting. I traveled to the Hatherly School, an elementary school in Scituate, one afternoon with Kari to work with two special education classes. We arrived, signed in at the office, and headed down the hall, our arms full of drums and scarves, with a guitar on Kari’s back and a bag filled with who-knows-what hanging off of my shoulder. When Kari walked into the room ahead of me, the room erupted. 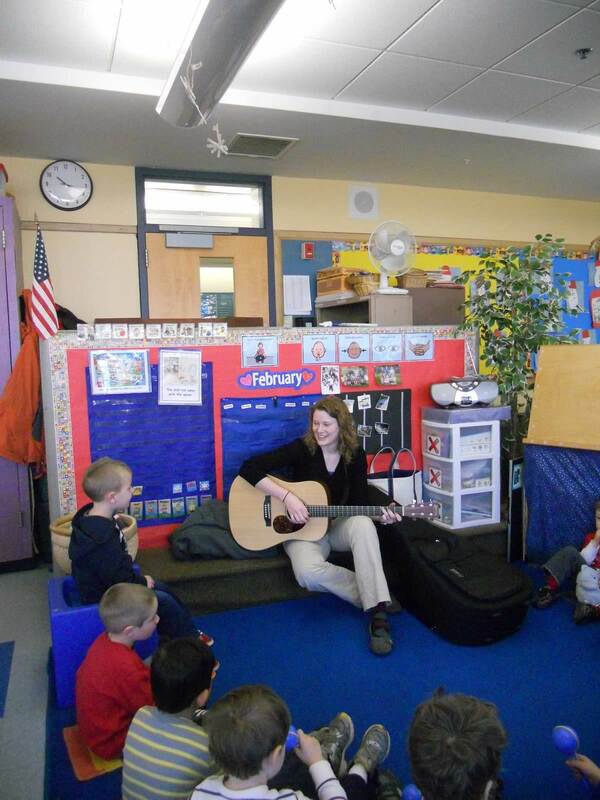 The kids could no longer focus on their math or reading – it was music time! We headed into one corner of the small room with a bright colored rug, bulletin boards creating a space around us, and a chair for each of the students, Kari, and me. I sat down anxiously and waited for the therapy to begin. Instead, Kari quietly took the guitar case from off of her back while asking the kids how their vacation was. However, after a soft bitter mumble from the few kids around us, Kari laughed off their negative reaction and started to strum. Soon, her chatty words turned to song, “Why hello there, you guys! I know I’m happy to be here. Hmm mmm, hello, hello!” The energy in the room suddenly shifted back to excitement. We all sang the hello song, each of us having a chance to say our own name and say hello to the rest of the class. Not only was this song encouraging friendly greetings, but it was teaching the kids to say their name and “hello” loudly and clearly. For anyone with a social disorder, such as autism, even saying hello to someone can be a challenge. Kari, though, with her bright smile and upbeat guitar playing, had everyone doing this with ease. The next song was a variation on “Head-Shoulders-Knees-and Toes,” with Kari’s own musical spin. The students stood, did the dance moves, and some even took a turn leading the song. I really noticed at that point that, despite the necessary therapeutic value these songs had for these kids, they really enjoyed this! It was a break from their school day. Especially for someone with disabilities, even the simplest of tasks can seem daunting and overwhelming. Music therapy was a care free and light hearted time set aside where they could simply be themselves, but still be absorbing necessary lessons like verbal skills and physical coordination. The lessons continued – more songs, more dancing, more swaying back and forth, more singing – the fun went on, and so did the therapy. The next class was more of the same – excited children, each eager to listen and play while still taking part in the therapy. I left the school feeling excited, rejuvenated, and encouraged at the idea that music had such an impact on these kids. Not only did they have a great time playing and singing with Kari, but they were reclaiming themselves as fun-loving children, able to let go of whatever troubles they were having in school earlier that day, and just enjoy the therapy for all that it was. Despite all of my wonderful exposure to music therapy, there is just one problem that I always come across when I leave the conservatory atmosphere: no one I know seems to respect music as a valid source of therapy. I learned quickly that this was because they didn’t understand it, but that’s no reason to dismiss it. This is why I am writing this piece today: through my own experiences, I have learned and will continue to learn more about music therapy so that I can share it with my peers. It is such an underrated resource, yet people use music every day. We have it in our cars, on our phones, in the grocery store – it is everywhere we go and it is used to alter or encourage our own moods. My hope is that people will be able to recognize music not only as an art form, but as a tool to help others overcome obstacles in their life. As the author Berthold Auerbach said, “music washes away from the soul the dust of everyday life,” no matter what that dust may be. 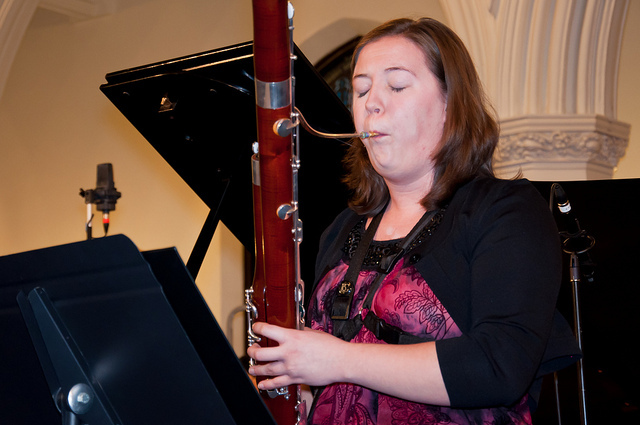 Alex is currently pursuing a dual degree in Bassoon Performance and Music Education at Northwestern University.